On Samsung J7 2016 "An error has occurred while updating the device software Use the Emergency recovery function in the Smart Switch PC Software" if you face this error and want to know the complete solution for this error on J7 2016 or J710F or J710FN or J710FXX, then you are in right place to solve this process. Now Samsung J710F got the new update Android 7.0 and if you try to downgrade the phone this error comes and you will not able to use the device. Solution for J710F An error has occurred while updating the device software. Use the Emergency recovery function in the Smart Switch PC Software as below. An error has occurred while updating the device software. Use the Emergency recovery function in the Smart Switch PC Software, solution using "Smart Switch" PC Software. An error has occurred while updating the device software. Use the Emergency recovery function in the Smart Switch PC Software, using download J710FN firmware and Odin3 flash tool. An error has occurred while updating the device software. 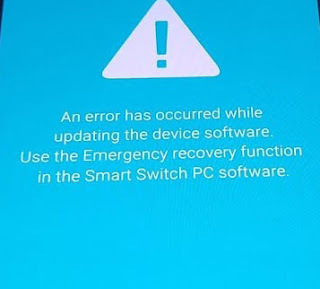 Use the Emergency recovery function in the Smart Switch PC Software, using J710FN bootloader firmware file, which can be download from the below link. To use this J710F small firmware tricks to solve "An error has occurred while updating the device software. Use the Emergency recovery function in the Smart Switch PC Software" you can visit the below link.